Read more "February 28th: Bullseye…"
Read more "February 27th: Reflection…"
…when I scroll through my timeline and find this delicious photo! Absolutely perfect last minute inspiration. God, I love this community! Read more "February 26th: Inspiration…"
Read more "February 25th: Legs…"
Read more "February 24th: Cleavage…"
Today’s photo is a re-colour of my most popular Sinful Sunday from 2016 and was also used to illustrate my second most popular written post, so sorry if you’ve seen it too often! But it was originally taken for the Sinful Sunday prompt that looked at depth of focus and edited to remove some of the detail. So for Throwback Thursday, I thought I’d add some clarity and replace that detail. How do you think it compares to the original? Read more "February 23rd: Clarity…"
Read more "February 22nd: Grip…"
Today’s photo is inspired by one Exposing 40 found on Twitter. 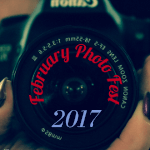 She is having an incredible month for Feb Photo Fest, presenting photos of herself and others, taken by a wide range of photographers so definitely check out her blog! Read more "February 21st: Magic shoes…"
Read more "February 20th: Waist…"
‘What are you wearing today?’ he asks. Read more "February 19th: Secret…"